There's nothing quite like the beautiful, rustic northern Michigan. Come summer time, it's the home of some of the Midwest's most stunning scenery, from the mighty Sleeping Bear Dunes to Torch Lake and other inland beauties -- to the countless small villages appearing frozen in time. The 18th at the Otsego Club's Classic Course was one of Gaylord's first elevated tee shots. Or you can take a stroll through more than two dozen serene wineries that lie around the Traverse City area. Biking and hiking trails abound, and we're not even scratching the surface as far as lakes and rivers to fish in. That's all fine, we suppose, but northern Michigan's real beauty comes from a spectacular, elevated tee box, overlooking an endless expanse of forest or lake, as well as a wide, appetizing fairway 100 or more feet below. • Classic Course at Otsego Club (No. 18, par 4, 310 yards): For our first drive, we pay homage to one of the founders of the northern Michigan elevated tee shot at the Classic course at the Otsego Club. This hole doesn't hide the fact it doubles as a ski resort in the winter. In fact, the blue tees lie between chairs of a chairlift (thankfully inoperable during the summer season). The hole is a mere 300 yards and to the left is a vast expanse of the club's main ski hill and lodge. One can only wonder how far left a hooked shot might go down that hill and, coincidentally, how far someone drove their cart down to play their second back up. 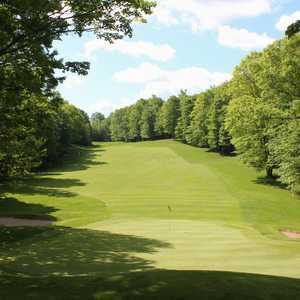 • Manitou Passage Golf Club (No. 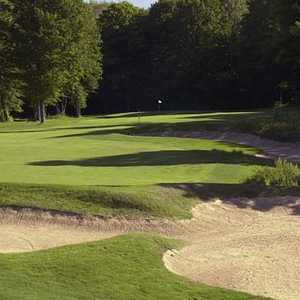 8, par 5, 570 yards): Perhaps the most difficult tee shot of this collection is at Manitou Passage (formerly known as King's Challenge), an Arnold Palmer design, 20 minutes west of Traverse City in Cedar. The view is great, but the fairway is not only tight, but crowned, making it difficult to hit. There's also a crest that will send your ball a good 30 yards farther, but if you don't hit it over, it will hit the upslope and stop dead. • Black Bear Golf Club (No. 17, par 4, 379 yards): This scenic drive became much easier after new management decided to mow down the heather to the left and right of the fairway. Now, as you gaze down the straight shot from the elevated tee, you can spray the ball about anywhere and be left with a decent shot into this green. With the wind, you could run it up to the green. Black Bear is one of the north's best bargains, making the 17th the most value-added scenic drive. • The Tribute at Otsego Club (No. 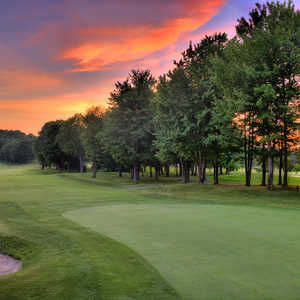 3, par 4, 430 yards): This new course at the Otsego Club is still being discovered amongst the gems of the Gaylord area. The first two holes on the Tribute are unassuming with a slightly uphill first and then a flat, dogleg second. What follows on the third is completely unexpected: a 400-yard-plus hole that drops so severely the green is almost within reach. There is a landing zone that corals many shots and flattens out about 50 yards from the green, making a very difficult approach shot steeply downhill. If you miss that approach however, you've got a similar shot on the fourth -- a par 5 that's level until the approach shot -- again steeply downhill. It seems that on the Tribute, after many greens you have to chug your cart up a steep incline to get to the next tee. This course knows what the resort golfer wants: elevation. • The Tradition at Treetops (No. 13, par 4, 290 yards): Treetops' 81 holes of golf certainly get the most nominations on this list, considering the three championship courses at the Treetops North facility have over two dozen elevated tees between them, but probably the most exciting for the average player comes on the 13th at the Tradition course, a short, 280-yard par 4 with plenty of space to run it up and the slope helps direct it towards the green. The first holes on Treetops' Premier Course and Signature Course also get an honorable mention. You could probably top your drive 200 yards on either of these openers. • Black Forest Golf Course (No. 18, par 5, 500 yards): There are better views in the state, but No. 18 is special because after 17 intimidating, tree-lined holes and tiny, mind-boggling greens, architect Tom Doak finally gives you a little breathing room with an elevated tee on this par-5 finisher. The landing area is even wider than it appears, as the fairway widens beyond a tree about 200 yards out. A good blast will give you a chance to hit the elevated green in two. • Arcadia Bluffs (No. 11, par 5, 633 yards): Michigan's most acclaimed public golf course at the moment, just about every shot at Arcadia is stunning. But the par-5 11th that plays out to Lake Michigan is a sight to behold and is becoming one of the state's most photographed holes. The rugged heather lining both sides of the bowled fairway mixed with the Lake Michigan backdrop will inspire your finest drive of the day (maybe two or three drives from the tee). If the 11th doesn't tickle your eye's fancy, the 12th will, which runs along the lake from tee to green. Now, since most northern Michigan counties appear to have some kind of ordinance requiring each course to have a handful of stunning elevated tee shots, there's sure to be others besides these beauties. The next time you arrive to one, be sure to have a camera, a "mulligan" ball, and as tempting as it may be, keep your head down.